Something seems to have changed between version 5.04 and 5.06 when it comes to copy paste and deleting. My workflow is sequence all my props in SS. When I am done doing that I have 5 lms files. I bring the first part into the sequencer, import my channel config and delete all the existing effects. This is my first sign something has changed, I just select the entire grid and hit delete, this normally takes a few seconds. The sequence I am working on took about 15 seconds just to delete the effects. Next I load part 1 as a new sequence and copy and paste between my now saved new sequence and part 1. I select my arches and spinners from part 1, this is 384 total pixels. This took about 30 seconds to copy and paste between the 2 seqeunces. In the past this few of pixels was a few seconds at best. When it came time to copy and paste my pixels tree, 16 x 50 pixels, forget it, this took minutes. Anyways something changed. If you need any additional information just let me know. 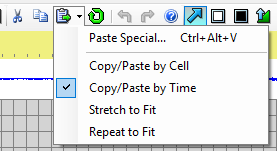 If you are copying entire rows, then copy/paste by time is much, much faster than copy/paste by cell. If you are copying between sequences, just make sure copy/paste by time is selected in both the source sequence and the destination sequence. I messaged you with a link to one of my sequences concerning this problem. Hope that was OK. Not sure if you were able to check it out yet.